Xi'an Cuisine on Hay Street, Chinatown is a hole-in-the-wall joint in the truest sense. We love it. While waiting for DonnaChang, the food blogger previously known as Miss Chicken, and who isn't Chinese, I gawp at 'The Biggest Mooncake in Australia' in the Sussex Centre. There's even a 'Biggest Mooncake in Australia' certificate to prove it, though I think the certificate was issued by the mooncake maker, which is cheating perhaps, like buying your own "World's Greatest Dad" t-shirt, but I'm happy to take their word for it. Or perhaps I'm mistaken and there is a guild of master mooncake measurers roaming the Earth with beards, robes, big white horses and a measuring tape, or perhaps I'm losing my mind with hunger. Anyhoo, DonnaChang arrives and we miraculously avoid a lager frenzy at the Covent Garden Hotel. For once we actually make it to Xi'an Cuisine before it closes. When we say Xi'an Cuisine is a hole in the wall joint, we really mean it. Inside is a tiny kitchen and three small tables, plus there's a few tables outside. This place is tiny. There is no tea which is unusual, can't even buy it, that kitchen really is tiny, they probably don't have room. And as DonnaChang points out, we can't complain when the food is so cheap. Instead I try some random Chinese fruit drink. Sweet and unusual at first, I got to like it though. Spicy & Hot Shredded Tripe $2.50. Offal-ly good and exceptional value. Cucumber with Garlic Sauce $3. Always a winner, but rarely this cheap. Fried Shredded Pancakes with Lamb, $8.50. Like stir-fried noodles except they use slices of thin pancake, cooked with plenty of veggies perfectly cutting the stodge. A huge serve and masterfully cooked too. The lamb was sensational, it tasted more like lamb backstrap than the mutton we were expecting. This dish is an old favourite of ours, we are so happy to find it again. Fried Tofu with Chili Sauce Meat (Hot) $8.50. Similar to mapo tofu but with a liberal dose of pepper on top, lots of salt and few fermented soy beans as well. This dish was very salty, too salty even for a salt junky like DonnaChang, who isn't Chinese. Spicy chicken and peanuts with rice - $8.50. Not art but a huge serve, great value. The sauce is sweet with a little heat from the dried chili. Pita pancake with pork - about $4 plus an optional 50 cents for coriander (or capsicum). Freaking awesome. The bread has a nice crunch to the outside, countered nicely with the moist, rich, mildly spicy pork filling. These are really popular here and highly recommended. Back again for a hangover cure... Noodle soup with vegetable and pork (or beef) - $8. A hot and sour broth with a nice slick of chili oil on top, stir fried pork slices, finely diced fresh and preserved veggies, Chinese mushrooms and tofu. Egg pita bread with green hot chili - $4. A pancaked filled with scrambled egg, it's even nicer than the pork bun. Lamb soup with clear noodles and pita bread - $10. A clear broth with a vinegar kick. Plain stodgey bread is served on the side to dunk in the soup. Potherb mustard and shredded pork noodle soup - $8. Thick noodles with a sour kick from lots of mustard greens. Noodle soup with braised beef shank & vegetables - $8. A thin simple broth with some slices of beef. Preserved vegetable and shredded pork noodle soup - $8. A nice thin tangy soup, not too spicy, a great flu buster. The more we visit here the more we like it. The staff are super nice, there's a lovely family vibe here with lots of laughter coming from the kitchen. 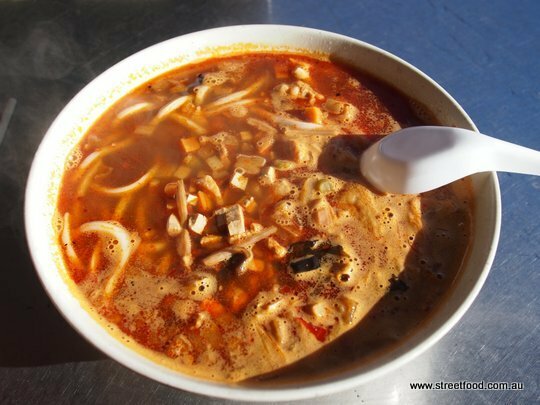 Xi'an Cuisine is at Shop 4 / 90 Hay Street Chinatown, diagonally across the road from the Entertainment Centre and McDonalds. Have wondered what this place was like. Loving your Northern Chinese jaunts! I'm over the moon that you did a review on this place; I've walked past a few times but haven't yet had a chance to give it a go. That stir fried lamb-pancake dish sounds scrumptious! Hopefully will be my next stop. Oh and I have to say, what a luminous idea to create a blog featuring hole in the wall eateries...and based in Sydney too! Boy am I in luck - thank you! We feel the same about this place, although if it got the hype would we be able to get a seat anymore? Love cold noodles in summer, worth suffering the heat for.